TokyoBunnie: New Mythicals from Monster Factory! New Mythicals from Monster Factory! 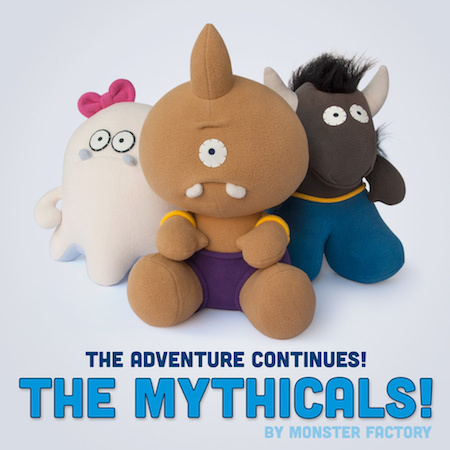 Remember the adorable Mythicals plush Kickstarter last year from Monster Factory that resulted in the wonderful mythical beings Carl the Yeti, Jeff the Pegasus, Spencer the Dragon, Margot the Unicorn, Louie the Monster, and Miranda the Sea Monster? Now, there's some new characters being added to this merry band of misfits! Meet...Paul the Minotaur, Feliz the Cyclops, and Martha the Ghost! A Cyclops named Felix. Felix would rather suffer the discomfort of not being able to see clearly than have to wear his glasses in public. A ghost named Martha. Rarely seen during daylight hours, Martha has been a night owl her entire… um… life? This new squad of magical creatures officially launches on October 26th, but are currently available for pre-order via monsterfactory.net. You can also find and buy the rest of the Mythicals on the site as well!